Advanced Learning Opportunity for GSA Welcome Center Volunteers. Provide learning opportunities for certified Granite State Ambassador welcome center volunteers. Provide word-of-mouth marketing exposure to member museums. 2 nights, for 2 people on STAR ISLAND on the Isles of Shoals! All meals and transportation aboard the M/V Thomas Laighton included. The certificate is valid during the Star Island Experience Week – Saturday, August 29 – Saturday, September 5, 2020. Pending availability, other dates may be possible. The fine print: This opportunity is only open to active, certified GSAs. 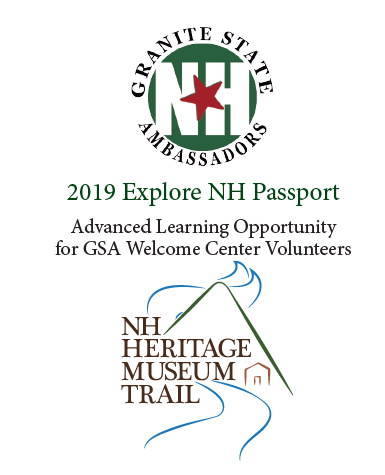 Your NH Heritage Museum Trail passport is non-transferable. 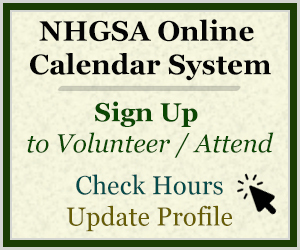 Passholder will be asked to show current NHGSA membership card along with official booklet to gain admission. Passbook entitles the passholder and one guest admission to each participating museum to give you the opportunity to experience the museum as a guest would. It is the GSAs responsibility to be sure passport is validated at each museum for entry into raffles (drawn at GSA Holiday Gathering in November 2019). Valid 2019 season. As museums add scavenger hunt and prize donations to our packages, we will add them below. Check back often! 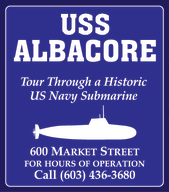 (603) 569-4554 Opens Memorial Day weekend 2019 through Columbus Day Weekend. Closed Memorial Day, Independence Day and Labor Day. (603) 476-5900 Opens Memorial Day 2019. Check website for hours and programs. (603) 569-1035 Opens June 1st for season. (603) 569-1212 Open May 1 – October 31, 2019. 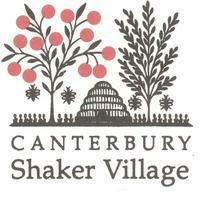 Opens mid-June – Columbus Day weekend. Open May – November 2019. 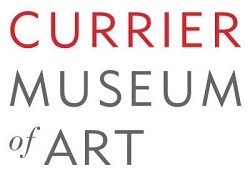 Open April 3 – mid-December 2019. (603) 783-9511 Open May – December. Star Island is one of the nine Isles of Shoals located seven miles off the coast of New Hampshire and Maine. All are welcome to explore the island for a day, enjoy a meal, spend the night, or attend a conference. People of all backgrounds are drawn to Star Island for its recreation, natural beauty, and simplicity. What keeps people coming back year after year, is the abundance of kindness and community. Star Island offers all-inclusive programming that focuses on a particular theme or topic such as art, history, ecology, spirituality, and yoga. Star is a place to learn, explore, enjoy the outdoors, and connect with friends both old and new. During July and August, the programs are family-friendly and multi-generational. There are supervised youth activities, meals together in the dining hall, and plenty of free time to explore the Isles of Shoals, or enjoy kayaking, tennis, and swimming. Guests stay in the rustic and historic Oceanic Hotel and can participate in softball games, chapel services, workshops, and lectures, or simply enjoy the view from a porch rocker.In June and September, the programs are more adult-focused. Some conferences last a few days, others a week, each with a unique theme or focus. Think of it as vacationing with a purpose! You can enjoy the activities or sit back and take in the island serenity. No matter who you are or what you’re interested in, Star Island is a beautiful place to be, full of people who care about each other and making the world a better place. For over 100 years, the non-profit Star Island Corporation has hosted conferences put on by dedicated groups of volunteers. Find out for yourself why visiting Star Island is a treasured family tradition for so many, and why guests describe their stay on Star as magical.